Bhadra yoga (भद्र योग) is one of the Pancha MahaPurusha Yoga. 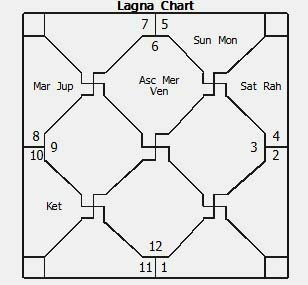 When Mercury is Exalted or Moola Trikona or Own House and placed in quadrant 1/4/7/10 (Kendra). Bharda Yoga is formed. Mercury rules Gemini and Virgo. Bhadra Yoga cannot occur with reference to every sign of the zodiac. Bhadra Mahapurusha Yoga can not occur in Aries, Taurus, Cancer, Leo, Libra, Scorpio, Capricorn and Aquarius ascendants. It can be formed only in mutable signs as Gemini and Virgo occupies quadrant only under these ascendants. Bhadra (भद्र) in Sanskrit means noble/gentleman. Bhadra Yoga is formed with participation of Mercury. So native is to be blessed with all the good qualities of Mercury (planet of intellect). Jatak (Native) born under Bhadra Yoga is brave like a lion, the destructor of enemies. Courageous and finds the way out in difficult situations. The jatak has youthful looks with well built body structure and broad chest. Bradra jatak is blessed with rare analytical mind and mercurial ability. The person accomplishes even impossible and unbelievable tasks that too with so much ease. They are expert in making quick decisions. They have logical mindset. The native lives a long life. Progress comes gradually. Bhradra Purush rises to highest ranks or achieves highest aims. In ancient texts region of Magadha (modern Bihar state of India) is associated with this yoga. The native should become King of Magadha. Magadha was one among Sixteen Great States (Shodash Maha Janpad ) in 6th century B.C. Bhdra yoga persons are ahead of their times and believe in innovative techniques. They are ambitious and progressive. They are always ready to serve society friends and relatives. They are admired for graceful behaviour. Horoscope of philosopher and statesman Dr. Sarvepalli Radhakrishnan. My name Is Swapna Mukherjee and I want to know does he have Bhadra yoga and Malavya yoga in his birth chart. If he has Malavya yoga will something bad happen for Ketu’s position in same house.